As an animal lover growing up in Kansas, our annual grade school field trip to the University of Kansas Natural History Museum was always a high point. I adored the famous Panorama of taxidermy, and the working, cutaway beehive, but what I looked forward to most was the chance to gaze upon a real jackalope. We adults require our animals to be just what they are, but I often think the world would be a better place if we hadn’t lost whatever it is about kids that allows them to accept the possibility of crazy animal hybrids. I’m as big a stick in the mud as any when it comes to combining species. After all, it recently took 30 minutes of bickering and this Wikipedia entry to convince me that cattle and buffalo had been crossed to produce an animal called a beefalo. If there is one place such a creature could roam free, it’s in the children’s collection at the library. In fact, there are so many weird animals to be found here, I sometimes think of it as a warmer, fuzzier Island of Dr. Moreau, with the sociopathic, mad scientist of that title replaced by a maniacal Lisa Frank, fresh off a post-doc fellowship in genetics at Johns Hopkins, flush with grant money, and ready to combine as many cute animals as she can get her hands on. 5. Kitten + Mermaid = Purrmaid. 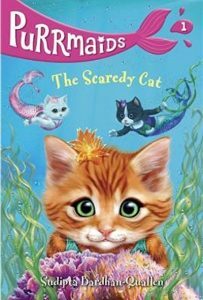 “It was a paws-itively beautiful morning in Kittentail Cove,” begins this series of early chapter books. Can you go wrong with a start like that? Kitten-mermaid hybrids Coral, Shelly, and Angel, with no visible gills (perhaps they invoke the same magic Daryl Hannah used to allow Tom Hanks to breathe underwater at the end of Splash), navigate the treacherous distance to Tortoiseshell Reef. But can they keep from devouring their own tails? 4. 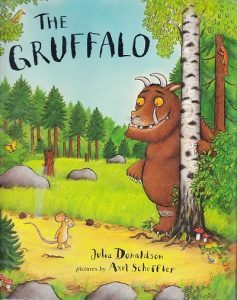 Grizzly bear + Buffalo = Gruffalo. In addition to being hailed as a modern classic, an animated version of this picture book received an Oscar nomination for Best Short Film. I agree with the Guardian reporter who called it a scandal that its author, Julia Donaldson, who was Children’s Laureate of the UK from 2011-13, is not better known. Her books, which include What the Ladybug Heard, Stick Man, and Room on the Broom, are as clever as the mouse in this story, who outsmarts every predator in the forest, including the Gruffalo, rhyming in couplets all the while. 3. ? + ? = Hank. 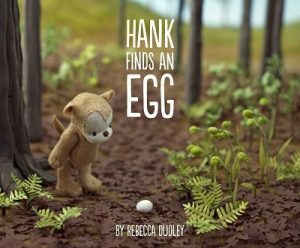 In Rebecca Dudley’s Hank Finds an Egg, Hank finds an egg. When the egg hatches, it’s obvious what kind of animal was inside. Just what Hank is, however, remains a mystery. Puppy? Bear cub? Weasel in a sock monkey costume? In a sequel, Hank Has a Dream, Hank has a dream. But we still don’t learn what knitting of species produced him. 2. 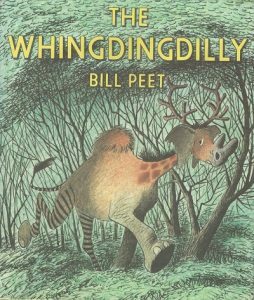 Camel + Zebra + Giraffe + Elephant + Rhinocerous + Reindeer = Whingdingdilly. Bill Peet, who had a hand in many of the animated features of Disney’s first golden era (Snow White and the Seven Dwarfs, 101 Dalmatians, and most famously, due to a falling out with Walt Disney during its creation, The Jungle Book) before he turned full-time to children’s books, may hold the record for combining the most species. He also holds the record for most books ever written about the experience of keeping a pet capybara (one). 1. Cat + Bird = Catwings. Ursula K. Le Guin’s children’s fiction is as thoughtfully beautiful as the adult science fiction and fantasy for which she has garnered so many awards. Her Earthsea Cycle is about as good as fantasy for older kids gets, and the four Catwings books she wrote for younger readers decades ago are still as irresistible to their audience as real live winged cats would be. 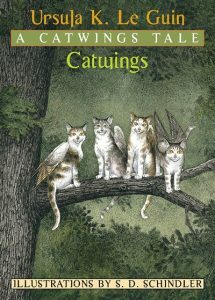 Mrs. Jane Tabby’s four kittens, Thelma, James, Harriet, and Roger can fly somewhere better than the Dumpster in which they were born. But when they see themselves in a mirror, do they do that weird bitey thing cats do when they see a bird outside a window?